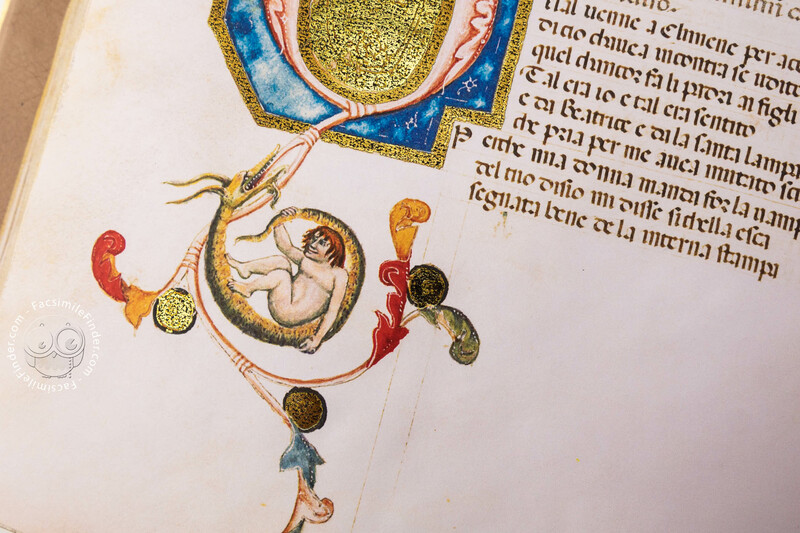 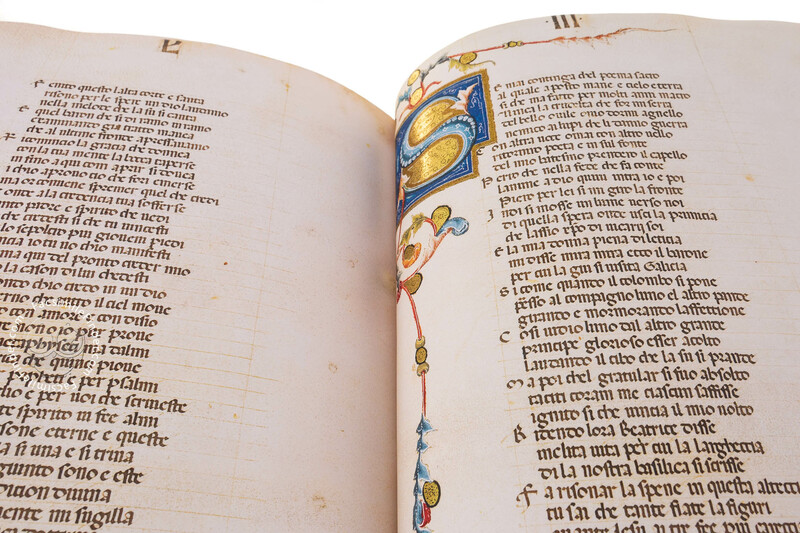 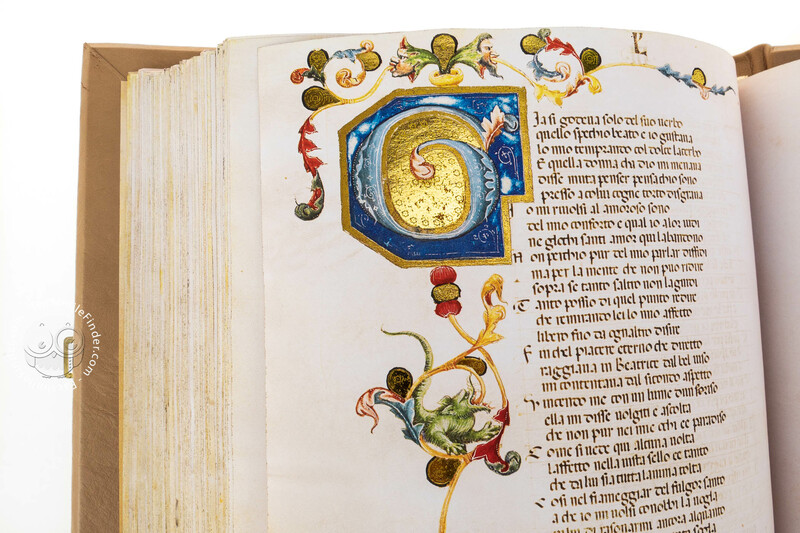 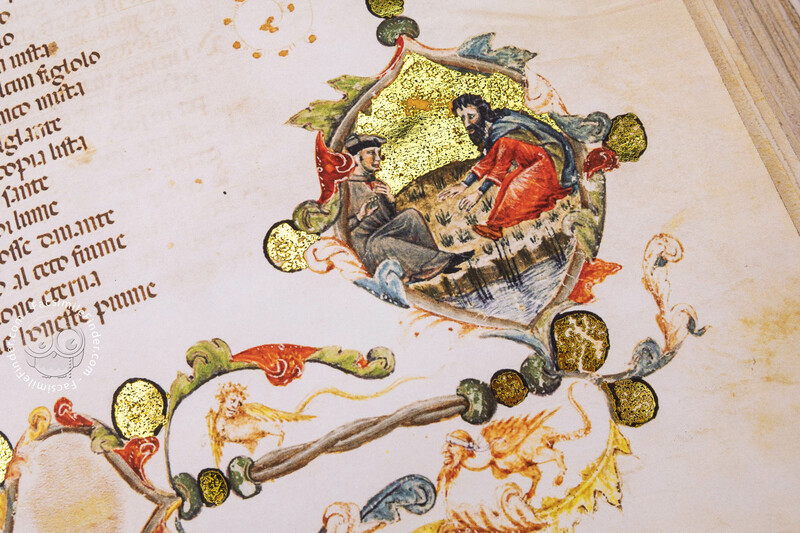 The manuscript Codice 9 in the Seminario Vescovile in Padua is an interesting and fascinating version of the Divine Comedy from the Italian peninsula. 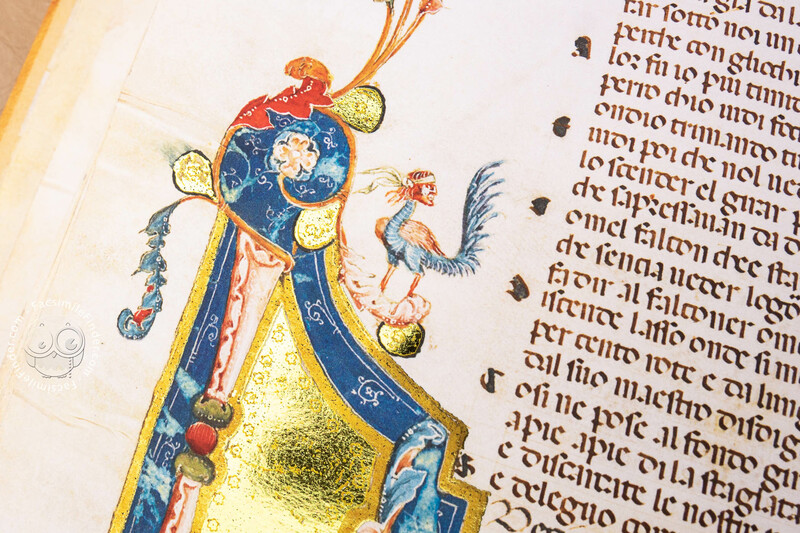 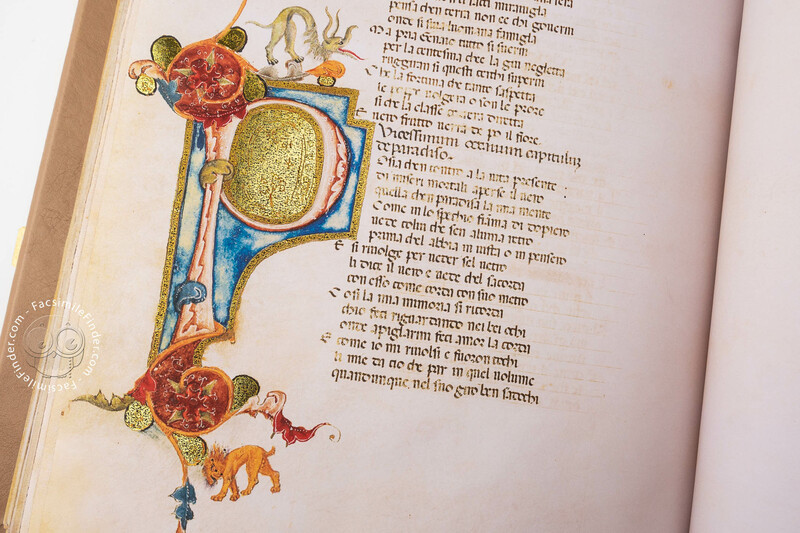 The codex was written and illuminated in the second half of the 14th century and it features a rich illustrative apparatus which includes 1 zoomorphic initial, 4 beautifully illuminated historiated initials, 3 superbly designed title pages, and over 100 drolleries. 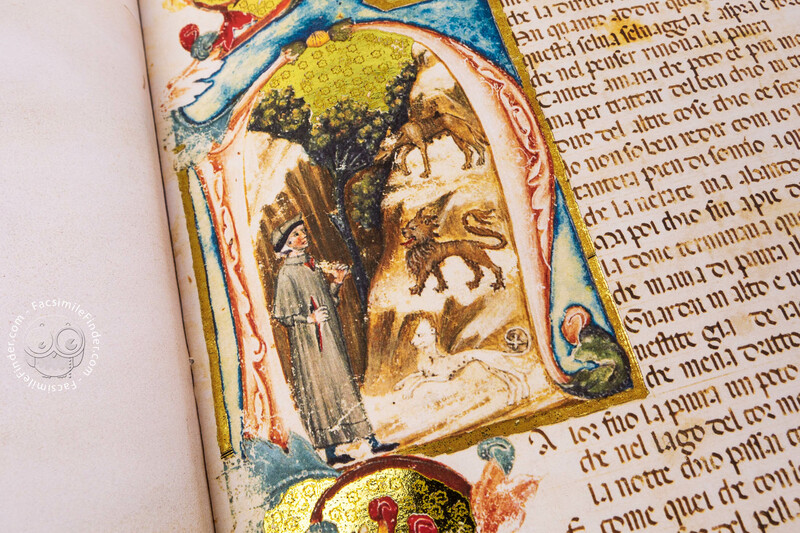 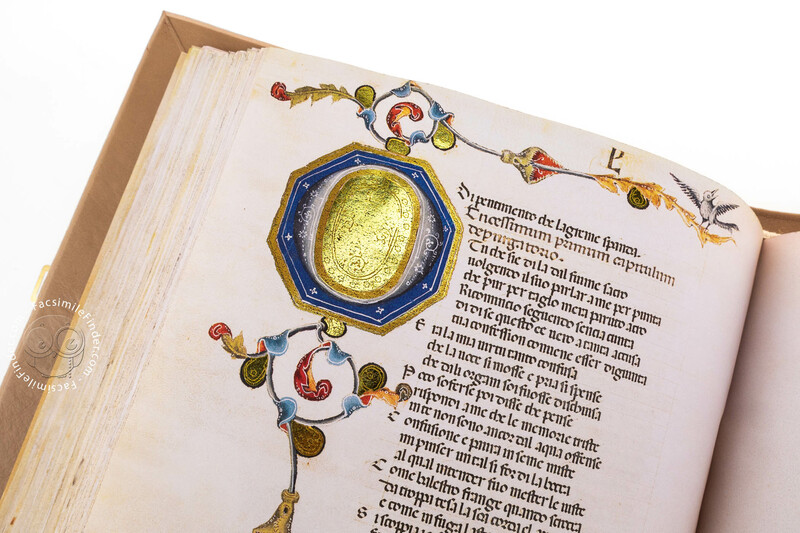 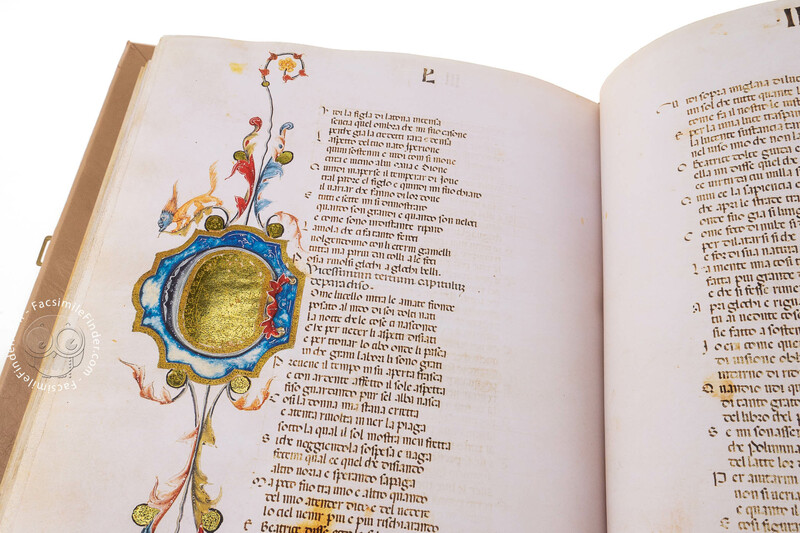 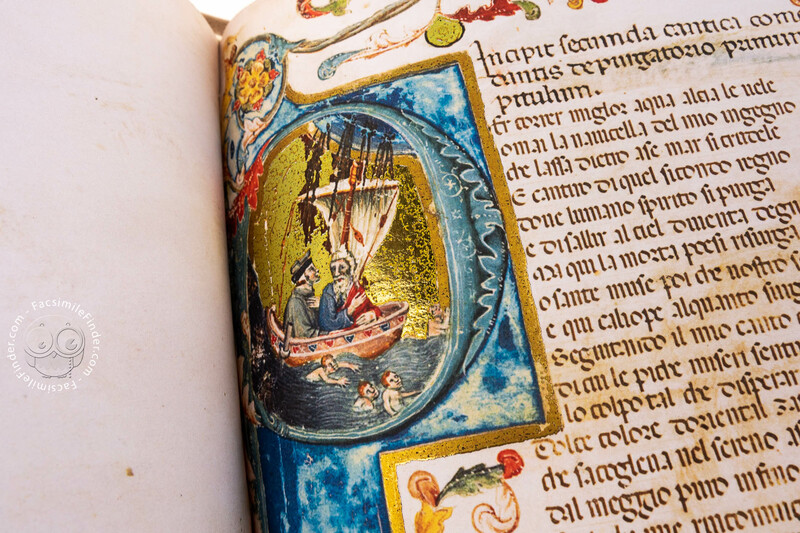 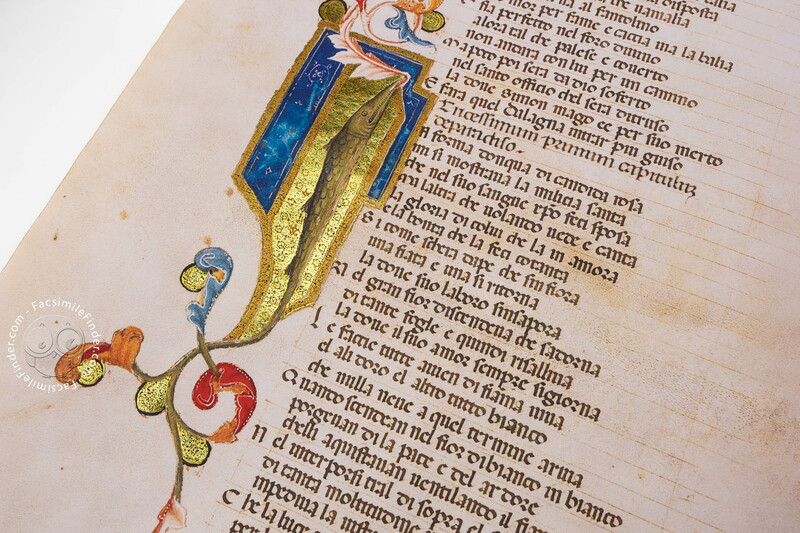 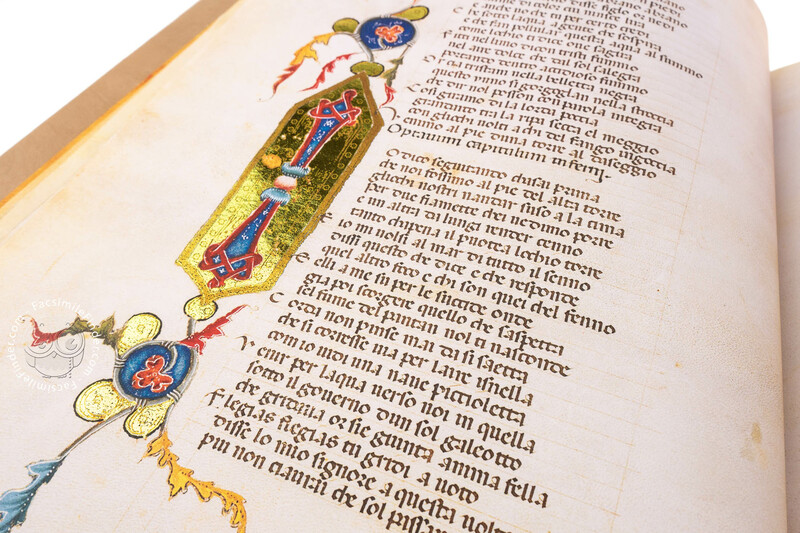 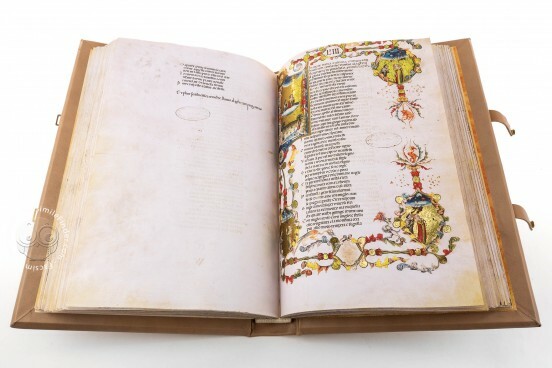 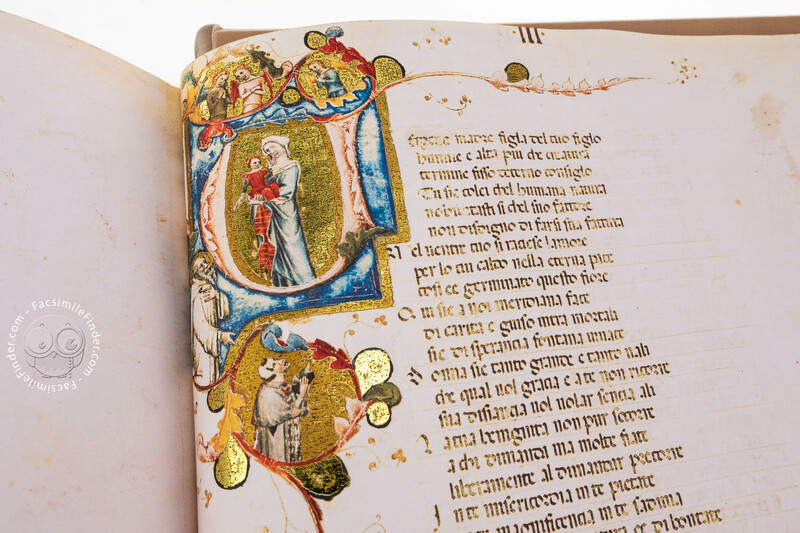 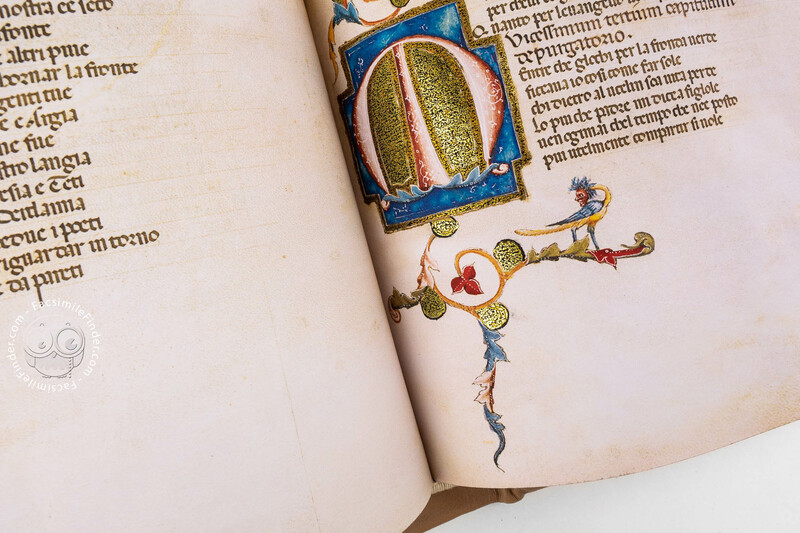 Written in Italian, this manuscript contains – as the title suggests – what is to be considered Dante’s opera magna, the Divine Comedy, and short passages by Jacopo Alighieri (1289-1348) and Bosone da Gubbio. Codice 9 exhibits an assorted iconographic apparatus featuring over 100 droleries and 3 frontispieces (one for each cantica) displaying historiated initials and lavish friezes (ff. 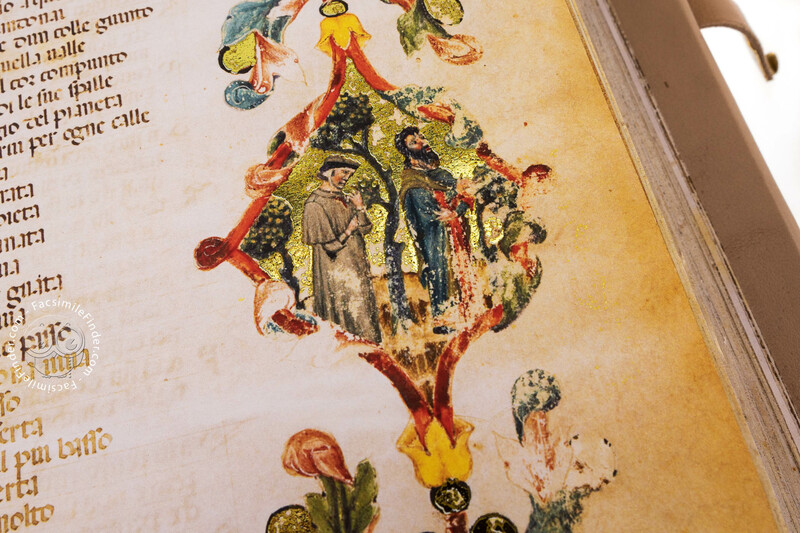 1r, 55r, 109r) which depict some of the main scenes of the text on golden ground. 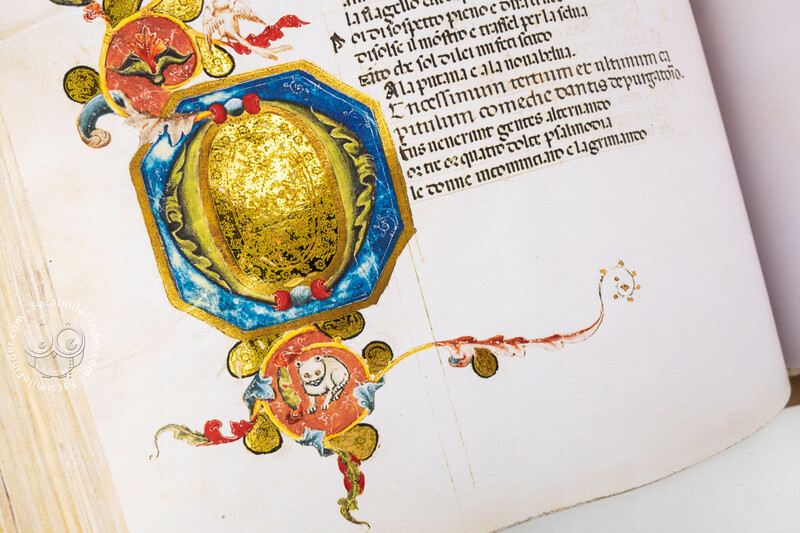 The individual scenes are connected by means of acanthus-like decorations and anthropomorphic and zoomorphic drolleries depicting vividly drawn grotesque figures, all of which can be found alongside the text and on the bas-de-page, making the page more entertaining to the reader. 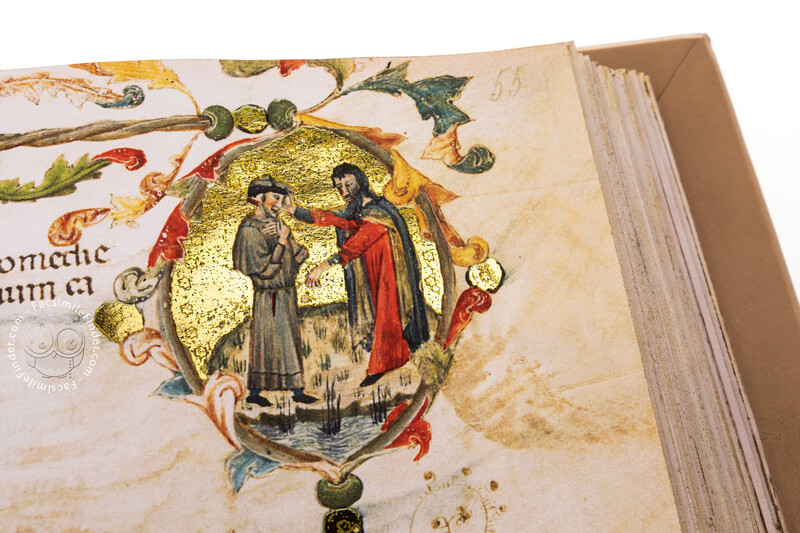 The place of production remains unknown and so does the commissioner, who, according to some of the latest leads could be identified as one Michelino della Stacciola, who in 1372 was forced to cede his feud in the Marche region to Galeazzo Malatesta (he will become podestà of Gubbio); should the identification be confirmed, it could also shed some light on the area of production of the work, currently thought to be the Umbria region. 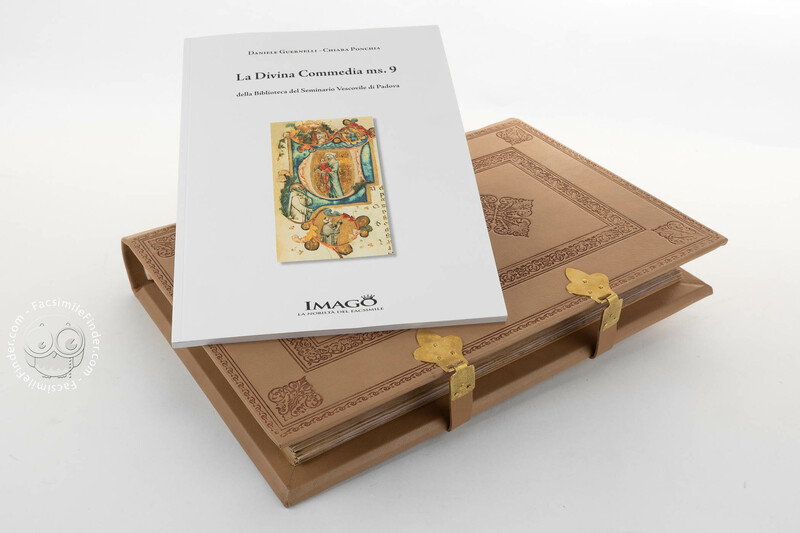 The story of the manuscript is quite obscure, however, its journey seems to be accounted for from 1720, when the codex became part of the collection of the Biblioteca del Seminario following its purchase by the librarian Francesco Canal from Alfonso Alvarotti, who claimed, in a note left in the manuscript, that he received it as a gift from Andrea Cittadella in 1717. 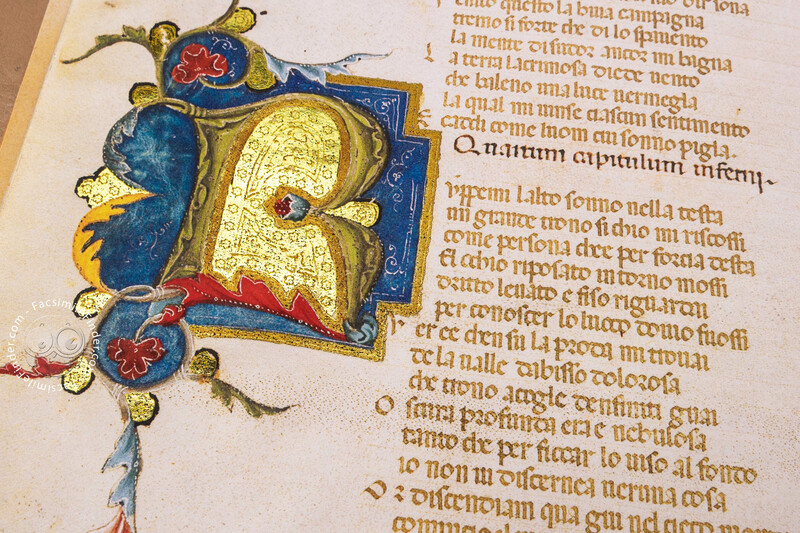 The script of Codice 9 is beautiful example of Gothic rotunda featuring letters that are not as angular and compressed as Gothic textura, however sharing a few features such as the use of two forms of d, r, and s. It appears there are no abbreviations. 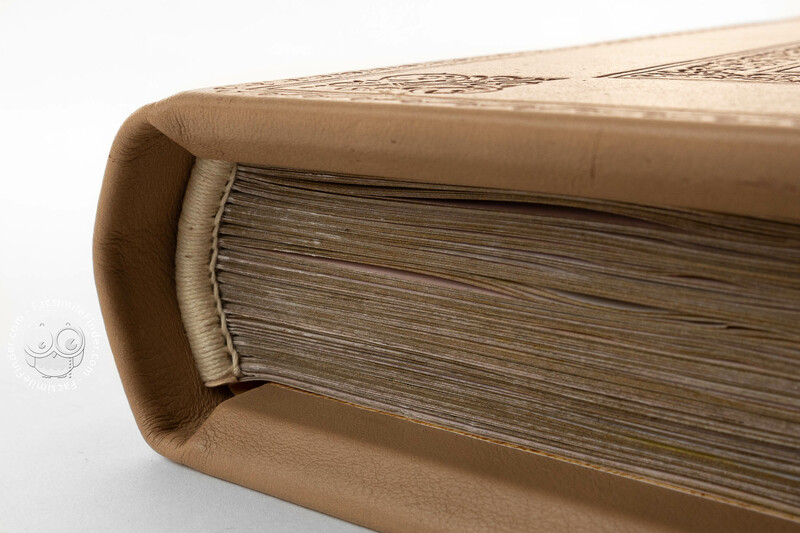 Unfortunately, like many medieval manuscripts, Codice 9 lost its original binding and now features one dated to the 19th century. 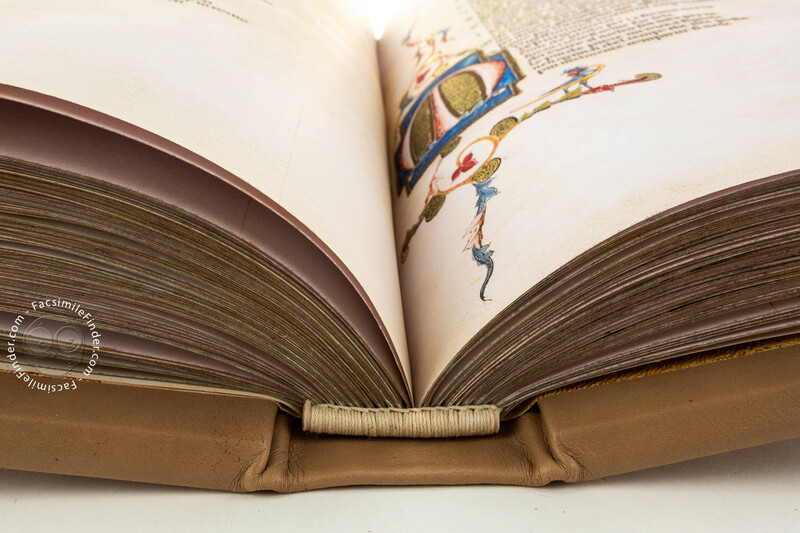 Manuscript book on parchment − 37.6 × 25.6 cm − 334 pp. 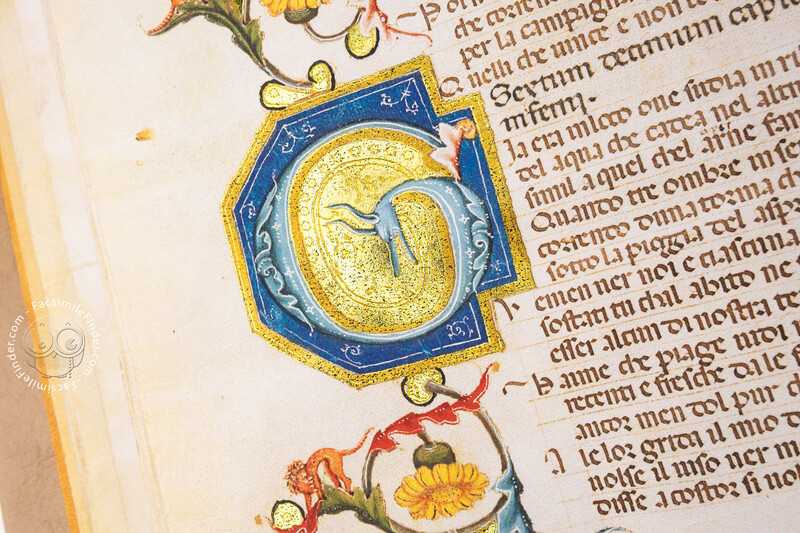 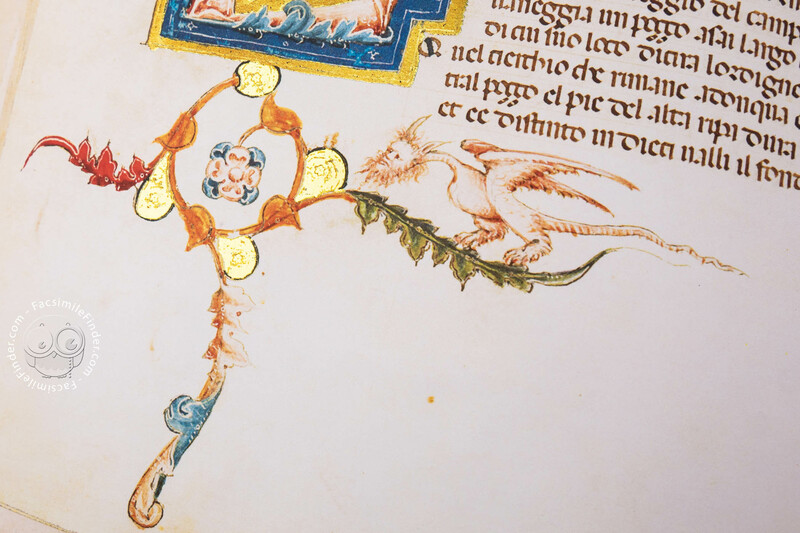 1 zoomorphic initial, 4 historiated initials, 3 miniatures, and over 100 drolleries. 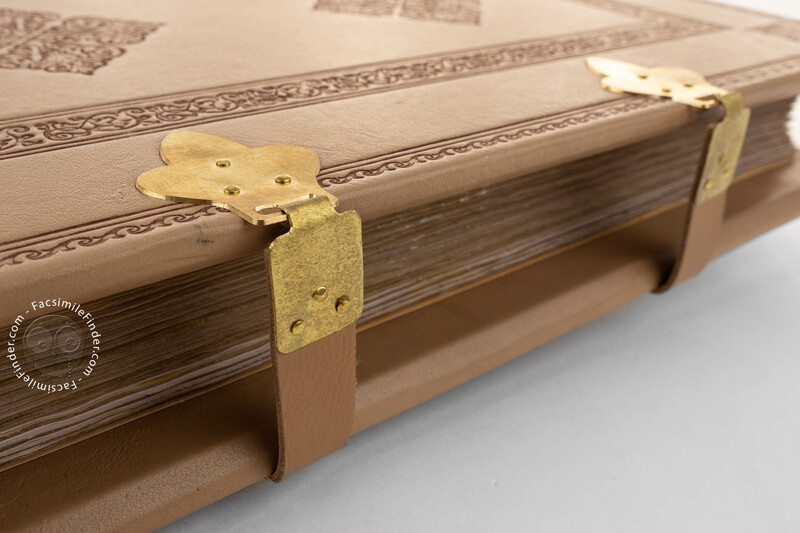 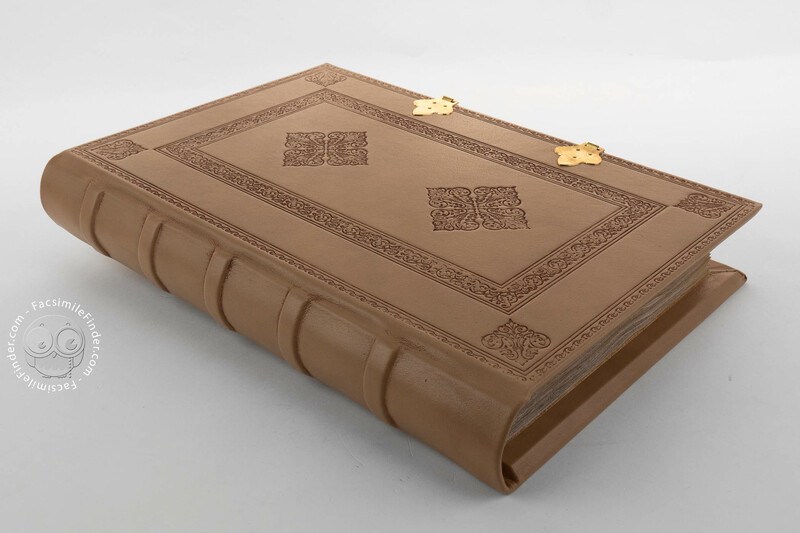 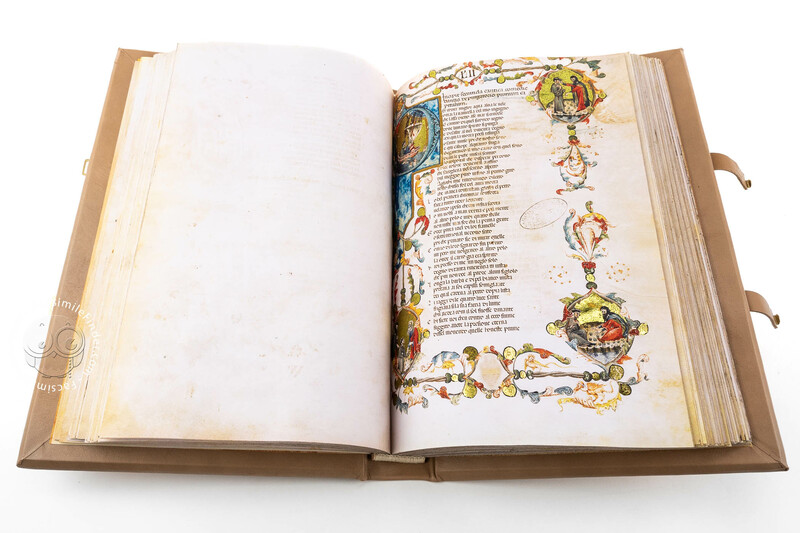 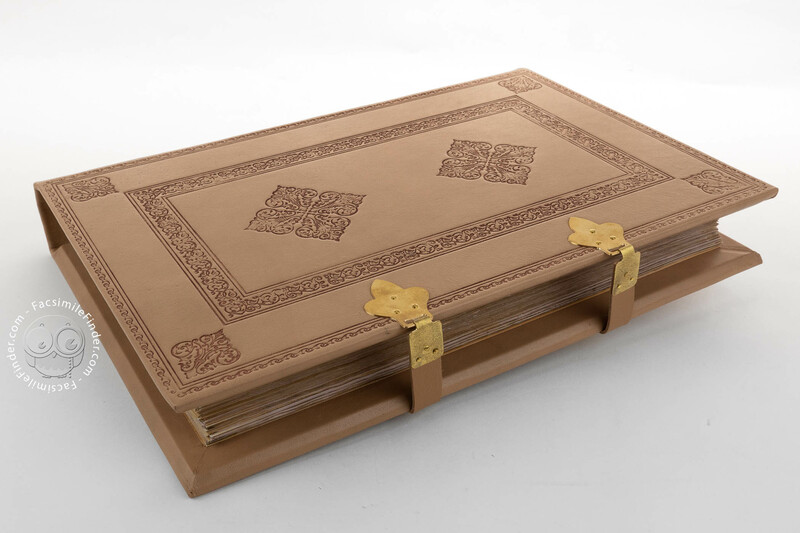 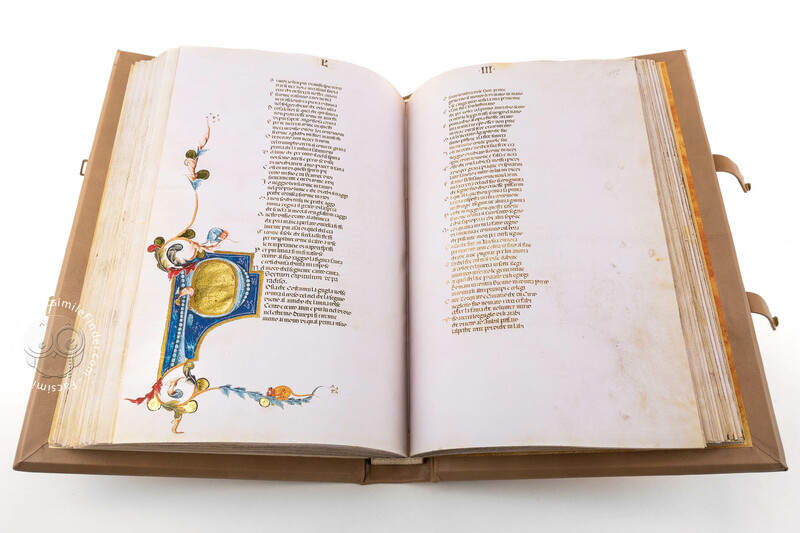 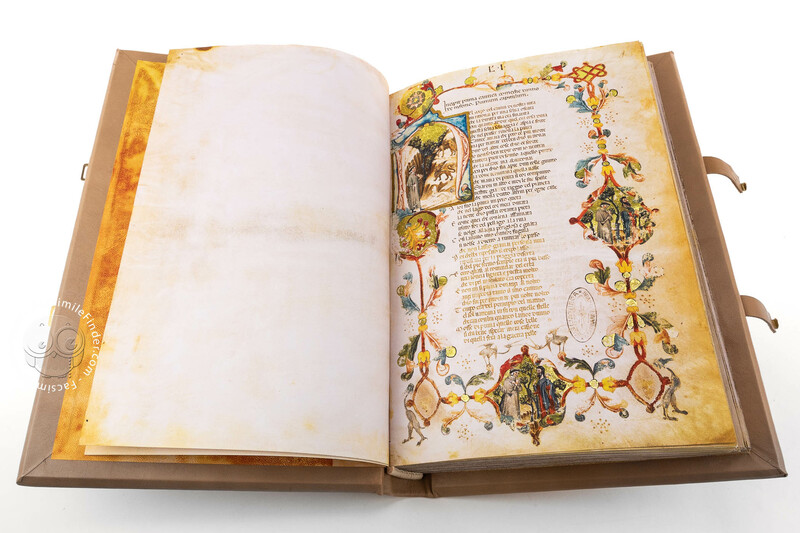 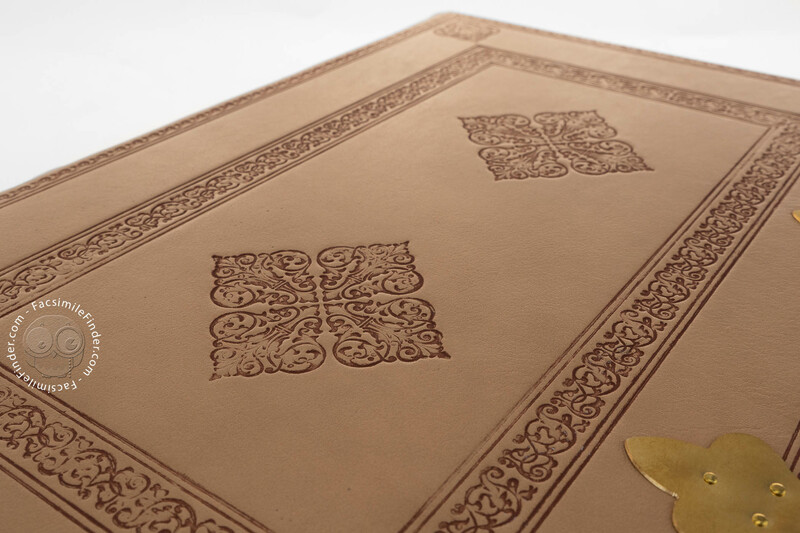 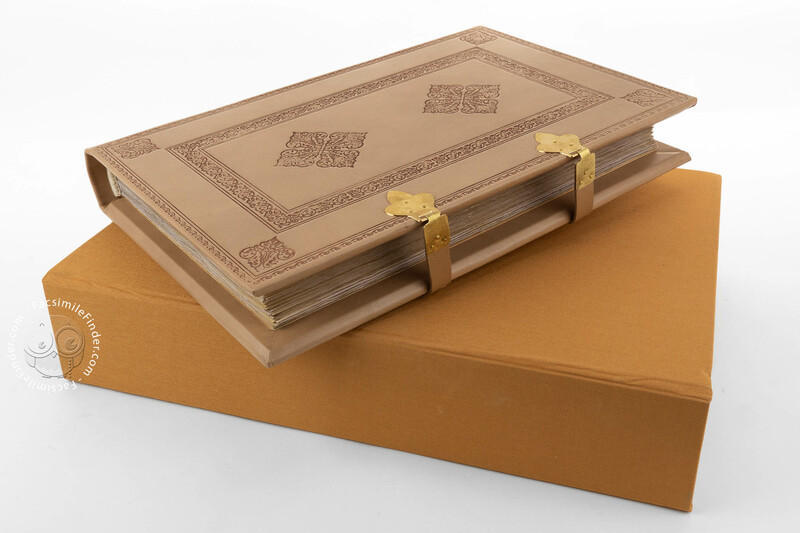 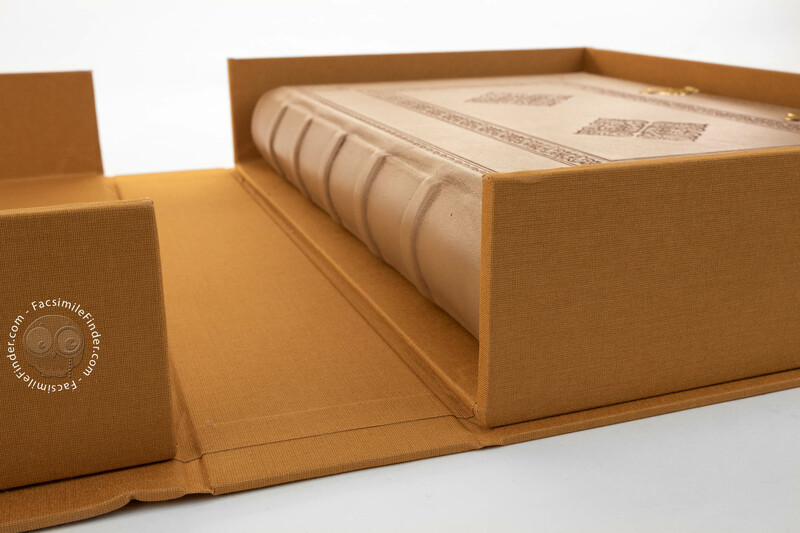 Full-size color reproduction of the entire original document, Divina Commedia di San Bernardo: the facsimile attempts to replicate the look-and-feel and physical features of the original document; pages are trimmed according to the original format; the binding might not be consistent with the current document binding.